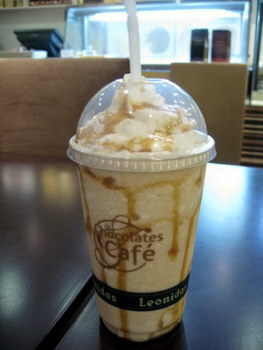 I’ve been a big fan of the Southern California Leonidas Cafes for some time now. They not only have excellent, fresh Belgian chocolates, but they have coffee drinks (mostly with chocolate), too! My summer favorite is the blended White Chocolate Caramel Coffee drink. Unlike other white chocolate drinks, like the ones at Starbucks, this one isn’t too sweet at all and has the same creamy, milky flavor that you find in a really good white chocolate – complete with notes of vanilla. The caramel increases the sweetness of the drink slightly, but it also adds a buttery richness. That said, the drink is very smooth and light. It’s easy to drink a big one, as they’re much less filling than similar drinks at some other coffee houses.